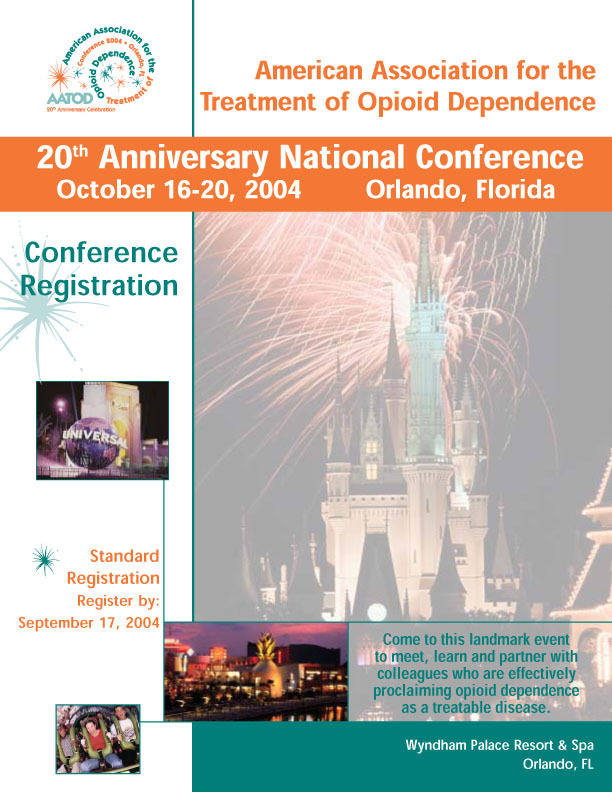 Approximately 1,300 individuals participated in AATOD’s 20th Anniversary National Conference, which convened against the magical backdrop of Orlando, Florida. The participants included treatment providers from across the country discussing both U.S. and international issues in addition to government officials, patient advocates and researchers. The Conference continued in its tradition of offering intensive pre conference sessions, updating courses for clinicians and patient advocates. It also provided two groundbreaking sessions, focusing on opioid treatment in correctional settings in addition to providing program managers with a better understanding of implementing risk management measures in the OTP setting. This webpage contains a significant amount of information, which was included as part of the workshop presentations. This is the first time such information is being made available. The Conference achieved its objectives in advancing a number of AATOD’s critical initiatives, including expanding access to methadone treatment through the criminal justice setting and working to better understand the impact that prescription opioids is having on OTP admission. This anniversary conference provided a critical link between past conference successes and our next event, which is scheduled to convene during April 2006 in Atlanta, Georgia.